This individual Report Wireless POS Market Segments, Size and Strategy is available for purchase. This Report is available to members of Mercator Advisory Group’s Emerging Technologies Advisory Service. Please be advised that this Report is normally part of a research and advisory service that provides ongoing support throughout the year. As such, this Report contains significant depth of content that is selected for its strategic importance to our members. (For a description of these services, see our Advisory Services section). Wireless POS (wPOS), which first gained media attention around the turn of the century (2001), has since developed into a far more realistic offering. Most of the leading terminal manufacturers have released wireless POS devices aimed at cornering this burgeoning market and with good reason. Based on research conducted with leading manufacturers and market end users. Mercator Advisory Group has estimated a potential market of over $1 billion for wWAN and wLAN point-of-sale terminals. "On the surface, the potential for wPOS is huge: however, terminal manufacturers will need to exercise caution when choosing the market segments to which they aim to serve," noted Mike Friedman, Director of Mercator Advisory Group's Emerging Technologies Service. "We cannot stress enough the impact an idividual market segment's operational, functional, and technologies requirements have on wPOS adoption." 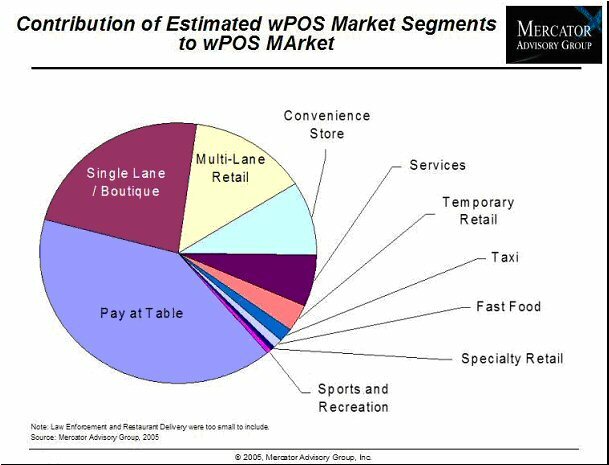 In Wireless POS Market Segments, Size and Strategy, Mercator Advisory Group examines the viability of wPOS in the United States across twelve identified market segments. The report estimates the total addressable market sizes of Pay-at-table, Single-Lane, Boutique Retail, Multi-Lane Retail, Convenience Stores, Temporary Retail, Specialty Retail, Restaurant Deliver, Taxi, Law Enforcement, Sports and Recreation, Services, and Fast Food. The result is a detailed analysis of a potential billion-dollar wave of terminalization. With an eye on potential adoption, the report further discusses the functional, technological, and operational implications of serving the identified market segments. Discussions of the market requirements offer insight into which segments vendors should target based on their market profile and competitiive advantages. The report summarizes current terminal manufacturer developments in wPOS and includes a brief overview of wireless WAN and LAN technologies. The report is 33 pages and contains six exhibits.